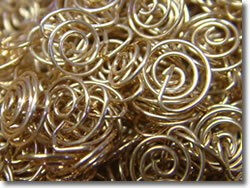 Copper Electroplating: We offer rack and barrel bright copper electroplating for components. Copper plating is used heavily in the electronics, electrical and water sectors for electrical conductance and corrosion resistance. Copper is also used widely as a decorative coating, as well as a method of restoring the surface finish on worn or eroded mechanical component. Strikes: Copper plating is commonly used as a strike, a base coat for secondary electroplating or finishing, examples of which include cadmium, nickel, chromium or tin. Process: We use the acid - (sulfate and fluoborate) process which is based on a 200-250g/L copper sulfate, 30-75 sulfuric acid solution at 21-49oC and a low current density of 20-100amp/ft2.